Happy Holidays! Heather here from FamilyVolley.com, wishing you and your family a very merry holiday season. It is so hard to believe that it is the end of the year and 2015 is right around the corner. One of the best ways to spend this time of year is playing a Holiday Game with your family! Playing together brings you closer and builds memories. Memories that last forever. So, in honor of the season, here is game for you and your family to play together over the next few weeks. Have fun and have spend time together! For this game you will need….. Tie the other end of the string to the end of the long part of the candy cane so the hook hangs down like a fishing hook. YOU WILL NEED ONE OF THESE “FISHING POLES” FOR EACH PLAYER. So make a bunch. Next, set up the stations for each player. You will need to take 4 candy canes and lay them flat on the table with the “hook” just hanging over the edge of the table. Once your stations are set up it is time to play. Each person takes the end of the chopstick without the candy cane and puts it in there mouth. Without using their hands, they have to use the chopstick candy cane fishing rod and catch the other 4 candy canes that are hanging over the table. The first person to catch all 4 candy canes, on their candy cane hook, together, WINS! This game even has a built in dessert. Candy Canes. 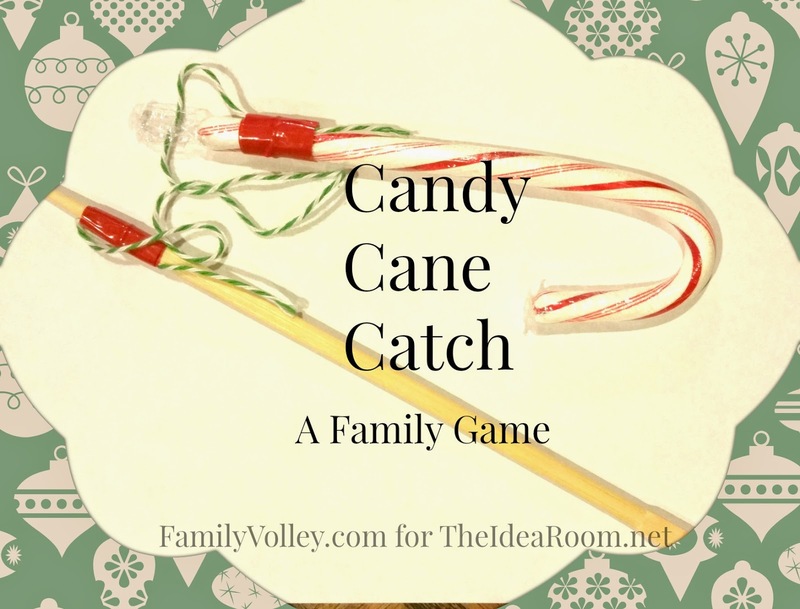 Get ready to laugh and take pictures as your family and friends “catch” candy canes and make memories together. This will quickly become of your favorite family holiday traditions. Enjoy your families. And don’t forget to slow down and actually savor the season. Thank you for all your support in 2014 and for letting me stop in to say hello here on TheIdeaRoom. It really is a most uplifting place to be. You can find me at FamilyVolley.com. On Pinterest, Facebook, and Twitter. Or send me an email. I love making new friends. This sounds like so much fun. I am going to get my family to do this today, when they get bored!